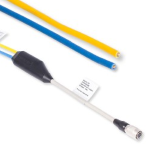 This "Y" cable enables simultaneous connection to opto-coupled I/Os and GPIOs, as found on newer ace cameras. The dual 10 meter cables can be cut to length as needed. Unless you need to access both the super-fast general purpose I/O and more noise immune opto-coupled I/O, we suggest using one of our other 6-pin cables instead. Please see the datasheet in the Resources section for conductor pin-out information.